Typhoon KAI-TAK slammed coast of S China leaving behind a trail of destruction. The storm destroyed 4,200 houses and damaged another 17,300 in south China’s Guangdong Province and Guangxi Zhuang Autonomous Region, Chinese officials said. At least several people were killed or reported missing as a result of the typhoon and an unknown number of others were injured. The storm forced 530,000 people to relocated as of early Sunday. About quarter of a million hectares of farmland were inundated. Cost of damage estimated at about a quarter o a billion US dollars. Vietnam. KAI-TAK, downgraded to a tropical storm, also claimed at least 10 lives in Vietnam, with many others reported as missing, and dozens injured. More than 5,000 houses were damaged and about 1,500 hectares of crops were inundated, reports said. Extreme rain events have destroyed tens of thousands of homes in South China’s Guangxi Zhuang Autonomous Region, central China’s Hunan province, east China’s Jiangxi province, leaving dozens of people dead, injured or missing. The rainstorms have affected at least 3 million people, destroying their food stocks, also destroying or damaging tens of thousands of hectares of crops. More than a million people have been affected in central China’s Hunan province, as storms dumped 200+mm of rain in less than 24 hours. Floods have claimed at least a dozen lives, leaving many others injured, damaging or destroying thousands of homes, and forcing the authorities to evacuate more than 30,000 people. In Yunnan province, more than 700 people are desperately attempting to control a major wildfire on Mt. Laoyingshan on the outskirts of Lijiang, said to be a popular tourist destination. There were no details available concerning the extent of damage or the number of casualties, as of posting. The blaze is one of a dozen or so significant wildfires aided by the severe drought in southwest, north and northeast China in the recent weeks. A significant land subsidence in Maohe Village, Liuzhou City, south China’s Guangxi Zhuang Autonomous Region, caused buildings to collapse, affecting an area of about 7 hectares, and forcing the authorities to evacuate more than 1,700 villagers. Large masses of snow and ice slid down the Annapurna Mountain range blocking the Seti River in Kaski district, triggering extensive flooding south of mountain, and leaving scores of people dead or missing. The “apocalyptic flood” swept away trucks and buses and forced the authorities to evacuate settlements on the river banks, reports said. China. A severe drought has affected about a million people in south China’s Guangxi Zhuang autonomous region and neighboring Guizhou province. The drought has left at least 100,000 hectares of cropland parched and hundreds of thousands of livestock with little or no drinking water. Iran-Iraq border. A 5.5-magnitude earthquake that struck Iran- Iraq border on Thursday has injured more than 3,500 people, reports said. The quake struck at a depth of about 10km, some 467 km (290 miles) SW of the Iranian capital, USGS/EHP reported. The shock caused moderate to severe damage to 50 villages, according to reports. California, USA.The U.S. Department of Agriculture (USDA) has designated 6 counties in California as agricultural disaster areas due to losses caused by freezing temperatures on Jan. 16-17, 2012. Glenn County in California has been designated as a Primary Natural Disaster area. Tehama have also been declared as disaster areas. Snowstorms have destroyed hundreds of homes leaving thousands of people homeless in the mountainous regions of central China’s Hunan Province. Hunan Province, China. Multiple snowstorms have destroyed hundreds of homes and left thousands homeless in the mountainous regions of central China’s Hunan Province. 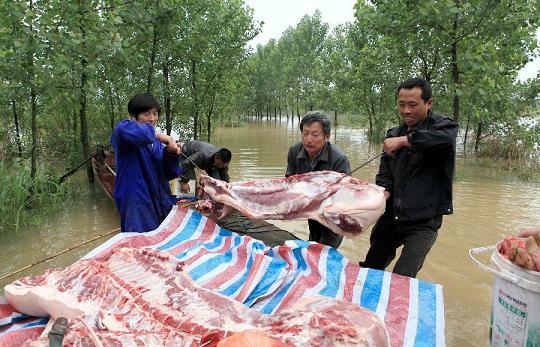 The storms have also destroyed thousands of hectares (acres) of crops causing millions of dollars in damage, Chinese official media reported. Authorities in Hechi City, where the discharge occurred, have confirmed that the cadmium-rich pollutants were discharged by a local mining company. Excessive cadmium levels, measuring at least three times the “official limit,” were detected in the river earlier this month, which killed many fish and prompted concerns over drinking water. The local fire department has dumped more than 80 tons of aluminum chloride into the Longjiang River to “neutralize” the contamination. Cadmium is a carcinogen. The metal is used to manufacture pigments and batteries and in the metal-plating and plastics industries. “The incident caused panic buying of bottled water in Liuzhou city at the lower reaches of the river over the past few days,” said a report. Liuzhou city supermarkets have run out of bottled water. Pakistan. More than 100 people have died from the tainted heart medicine in the Pakistani city of Lahore, the health ministry said. The heart medication was provided to patients free of charge by the state-run Punjab Institute of Cardiology. South Island, New Zealand. At least 82 of the 99 whales beached at the Farewell Spit on January 23 have died or were killed by the Department of Conservation in New Zealand, a report said. China: Yuan or Your Life? Nature’s Response to China’s Violent Assault on Ecosystems? Hundreds, possibly thousands of people have been killed, and many are missing in southern China after days of apocalyptic rain, violent flooding and massive landslides. At least 100,000 homes have been destroyed or damaged, with millions of hectares (acres) of crops spoiled by the deadly deluge. Nanping City deluged by torrential rains. Original Caption: Photo taken on June 20, 2010 shows the waterlogging Nanping City, southeast China’s Fujian Province. Caused by continual torrential rains since June 18, rivers continued to swell in Nanping City, leaving 24 dead and 28 lost so far. (Xinhua/Wang Shanglin). Image may be subject to copyright.